20 years. Wow. I feel very fortunate that I was in the right place at the right time to become part of the National Museum of American History’s newly minted Lemelson Center for the Study of Invention and Innovation. I started at the Museum as an intern the previous fall, and then joined the new Lemelson team in summer 1995 about five months after the Center debuted. We were a smaller outfit back then, with three of us—deputy director Claudine Klose, historian Joyce Bedi, and me—sharing one office with one phone, and director Art Molella, program specialist Tanya Garner, and administrative specialist Eva Fischer in other offices around the building. Soon archvist Alison Oswald joined the team, and happily she, Joyce, and I remain 20 years later, while Art just retired in July. Former National Museum of American History Director Spencer Crew, Dorothy and Jerome Lemelson, and Lemelson Center Founding Director Art Molella open the Lemelson Center in 1995. Hard to believe, but back in 1995 we were still using DOS on CRT computer monitors (I fondly recall the blinking cursor on the screen), and hearing our documents emerge loudly from dot matrix printers. That year, the World Wide Web really took off, e-mail became the primary business communication tool, and Microsoft’s new Windows 95 program added a task bar to our PCs, which were ever more user-friendly thanks to GUIs, or graphical user interfaces. The Lemelson Center’s earliest public programs, including our first New Perspectives on Invention and Innovation symposium “The Inventor and the Innovative Society,” were documented in color slides and hard copy prints; Smithsonian photographers hadn’t switched to digital cameras yet. I spent the first few years at the Center working primarily as a research assistant on annual thematic showcase exhibits and programs. 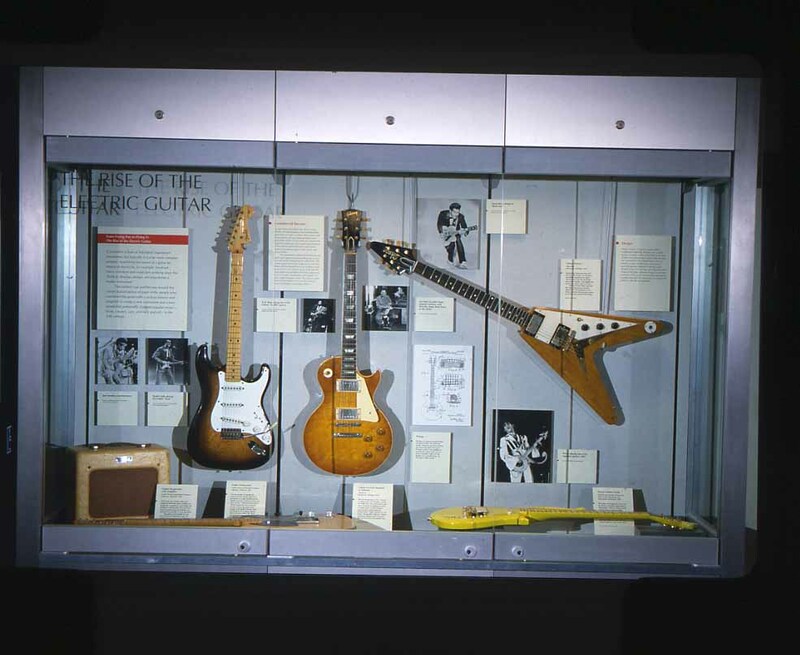 However, my most professionally rewarding experience in those early days happened when I got the unexpected opportunity to co-curate an exhibition about the invention and development of the electric guitar. Initially, it was supposed to be contained in two little showcases on the first floor west wing, but thanks to a generous guitar lender we ended up expanding the exhibition to the third floor Hall of Musical Instruments. I learned so much from my co-curator Gary Sturm about how to create an engaging show relatively cheaply and quickly (a couple of months is like warp speed at the Smithsonian). We laughed a lot along the way as we conducted our primary and secondary research about the early history of electrifying the guitar, met inventors, makers, and players, and turned into the Smithsonian’s experts on the electric guitar even though neither of us played and his specialty was Stradivarius violins. This memorable experience encouraged my focus on exhibition work, putting me in a good position to serve as the project historian for the Center’s first large-scale, traveling exhibition project Invention at Play (IAP) [unfortunately the original exhibition website link no longer exists but you can find related videos and educational materials on our new website]. I worked under the expert guidance of project director Gretchen Jennings with other members of the team, plus design-build contractors from the Science Museum of Minnesota, to develop this interactive exhibition exploring how play connects to invention. Grouped in thematic clusters—“Recognize the Unusual,” “Borrow from Nature,” “Jump the Tracks,” “Keep Making it Better,” and “Many Heads Are Better than One”—IAP featured a diverse range of inventors, famous and little-known, whose habits of mind and skills began in childhood play. IAP won the 2003 American Alliance of Museums’ “Excellence in Exhibition” award. The original 3,500-square-foot IAP exhibition opened at NMAH for a six-month run in 2002, then traveled to nine museums around the country before returning to NMAH, where it closed in 2011. A 1,700-square-foot version of the exhibition also traveled to 13 museums in the US and Canada. I had the privilege of hitting the road myself, traveling to host sites to conduct staff training and oversee exhibition installation. Seeing the larger world of science, children’s, and history museums provided me with useful new perspectives for our work at the Center. During the waning years of the IAP tour, I moved on to start developing our latest large exhibition, Places of Invention (POI), for the new Lemelson Hall of Invention and Innovation at NMAH. This time I served as the project director and one of the curators, working with a wonderful team of people at the Lemelson Center/NMAH and at our design-build contract firm Roto. The topic of “place” and it’s role in invention and innovation had been part of the Center’s research agenda since that first symposium I mentioned, threading through conferences, publications, interviews with inventors, and public programs, and finally culminating in this exhibition. 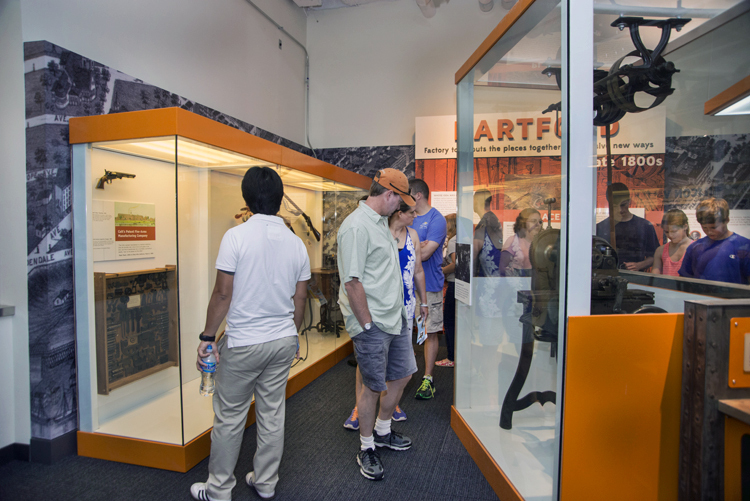 Visitors in the Hartford section of Places of Invention. © 2015 Smithsonian Institution; photo by Richard W. Strauss. Through stories, videos, artifacts, and interactive experiences, POI takes visitors on a journey through time and place to meet people who lived, worked, played, collaborated, adapted, took risks, solved problems, and sometimes failed—all in the pursuit of something new. Debuting July 1, 2015, the exhibition features six case studies­—Silicon Valley, CA, 1970s–1980s; Bronx, NY,1970s; Medical Alley, MN, 1950s; Hartford, CT, late 1800s; Hollywood, CA, 1930s; and Fort Collins, CO, 2010s—and a special interactive map where the exhibition team, POI Smithsonian Affiliate museums and their community partners, and the general public (both in-gallery and online) can add their places of invention stories. This summer we also published a complementary book, which further highlights the six case study communities plus three Smithsonian Affiliate “learning labs” using POI as a model for documenting local invention and innovation in Peoria, IL, Pittsburgh, PA, and Seattle, WA. Along with my colleagues, now I have the fun job of doing media interviews, leading exhibition tours, signing books, and helping plan POI public programs…while we look toward developing the next exhibition. Fortunately, we’ve learned a lot about visitors’ interests, expectations, and behaviors thanks to extensive evaluation of Spark!Lab and our exhibitions. A few key findings: Visitors are very interested in invention and innovation generally, but don’t know much about inventors beyond a few famous historic figures like Thomas Edison. So they enjoy learning about lesser known or even “surprising” historic and contemporary inventors, especially women and minority inventors who tend to get less attention. Visitors also like to learn about inventions that relate to their everyday lives and to personally experience the inventive process. 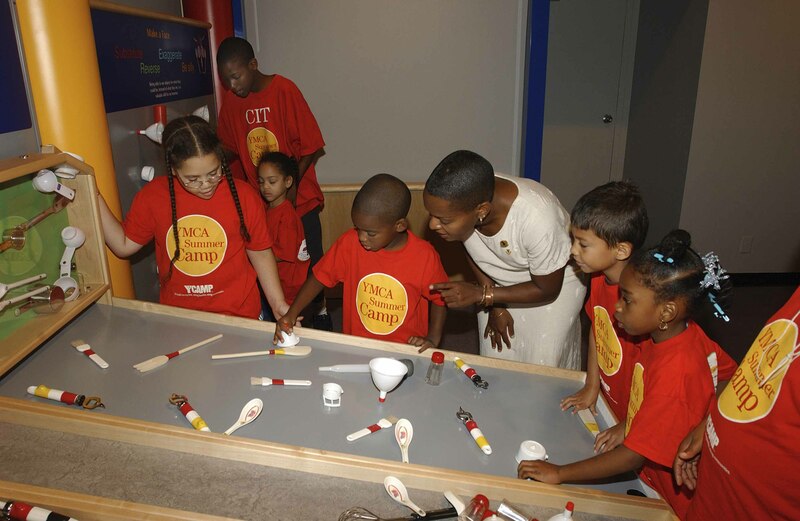 Visitors especially gravitate to engaging in low- or no-tech hands-on activities, not just touching computer screens. Better yet, if they can not only invent something but also take it home, they love it! What exhibition topics do you think we should explore during the next 20 years? The exhibition development process uses invention skills and mirrors the invention process generally.